A 3 month old street puppy in India had the terrible misfortune of getting stuck in a thick layer of tar near a road that was being repaired. She was trapped and unable to stand or move her legs when a young boy found her, got her out of the tar and then called Animal Aid to the rescue. Born on the streets of India, a tiny stray puppy had to figure out from day one how to survive. Somehow, he fended for himself for his first three months. But when the puppy got drenched in tar at a construction site, his life was truly at risk. 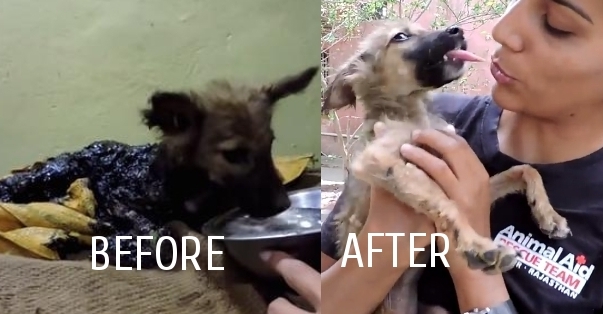 A stray, it seemed the little puppy would have no one in the world to care for him.Luckily, the amazing people at Animal Aid came to the rescue. Responses to "Puppy Covered In Tar Gets Most Beautiful Rescue (Video)"